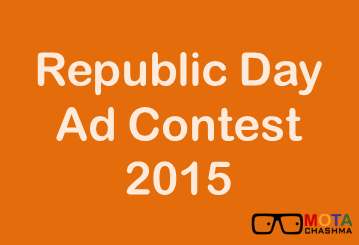 Republic Day Contest 2015 is a ad Design Competition on the occassion of Republic Day of India. 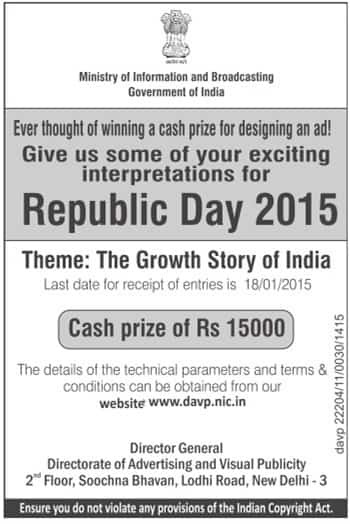 The participant have to Design an Ad on interpretations for Republic Day 2015. The ad can be designed either in English or Hindi. The advertisement should be designed in a digital platform preferably Corel Draw 15, Adobe Photoshop (CS-5) or Illustrator. Theme of Republic day contest is: The Growth Story of India. Details It should be the original work of the person and there should be no plagiarised content. The winner of the Ad Design Contest will receive Rs. 15,000 cash prize. Each individual can submit only 1 ad for the contest. The Ad can be designed either in Hindi or English. The Ad has to be submitted in a Pdf format. Register: Go to the website davp.ni.in. If it is the first time that you are entering into any such event then you have to register for participating into the contest by selecting "click here to register" and then type your name and e-mail id. Login: After successfully registering on davp.nic.in you will receive an e-mail which will contain your user id and password. Use these id & password to log in. The applicant should give his/her Name, Address, Telephone Number, Mobile Number and Bank Account details and Pan Card Number in the prescribed format and enter the submit button. E-mail address and name cannot be changed and it will be same as used while registering for the contest. Step 2: Upload Attachments (In PDF Format) This Step has to be followed After Submission of Application Form. The candidate has to upload the ad design creted by him/her in the pdf format and with this the online application process is completed. Shortlisting of Entries- Out of all the entries received the selection committee will select the 10 ad design and these 10 individual will then be notified to provide the designs in a High Resolution format (of over 300 dpi) and in an editable open file.